It’s been a whole week since I updated – sorry! Nothing particularly exciting has happened. We’ve been taking it easy our last couple weeks. Perhaps a bit too easy, thought. Now we’re sort of overwhelmed with all the things we’d like to squeeze into our last week. Mother Joseph, prayin' and stuff. I went on a second Capitol tour on Thursday. My roommate Liz, who is a congressional intern, was doing it for the engineers in the apartment who otherwise have no chance to visit the Capitol, and I liked the idea of getting to see the building again at a slower, more personalized pace. I got to see parts of the Capitol that my first tour blew past, like the old Senate Chamber or the original Supreme Court. Granted, much of the pieces in those rooms were replicas, but it was still interesting to see them recreated. I also had a chance to seek out two statues of interest as part of the state statues collection. The first was Father Marquette, which we naturally took a group shot of. 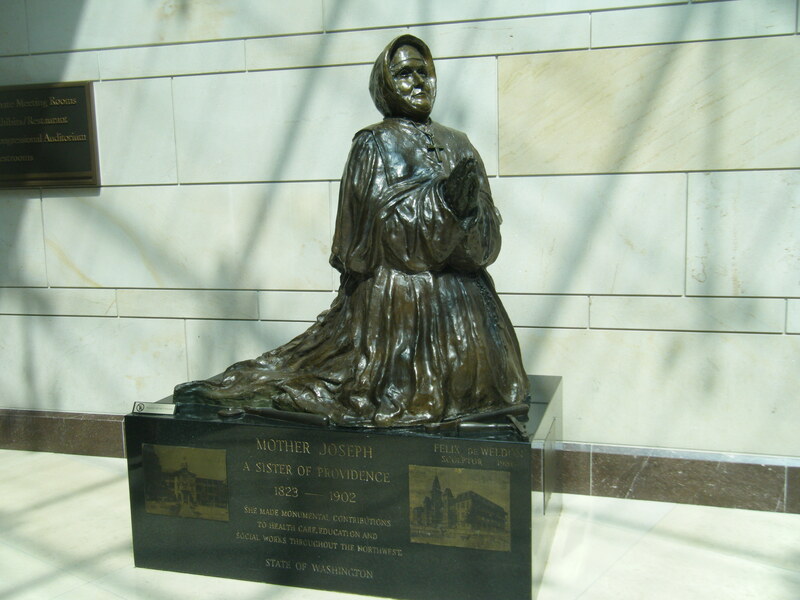 The second was Mother Joseph, AKA Providence Health Care’s mascot. Sort of. Today we ventured into Georgetown. This was something I really wanted to do, because I feel like we’ve done a lot of sightseeing related to specific sights and locations like the monuments and museums, but not a lot of just wandering and seeing parts of the city. I had heard Georgetown described as a “posh” district and it certainly lived up to its reputation. The streets are lined with tons of preppy, hipster stores like Urban Outfitters, Lacoste and Ed Hardy (bleh). There were also tons of restaurants and artsy stores. It’s definitely a great place to window shop. The line of people willing to stand in line for a half hour to pay $3 to devour a morsel of deliciousness. No visit to Georgetown is complete without stopping by Georgetown Cupcake, or at least that’s what every visitor to DC is told. 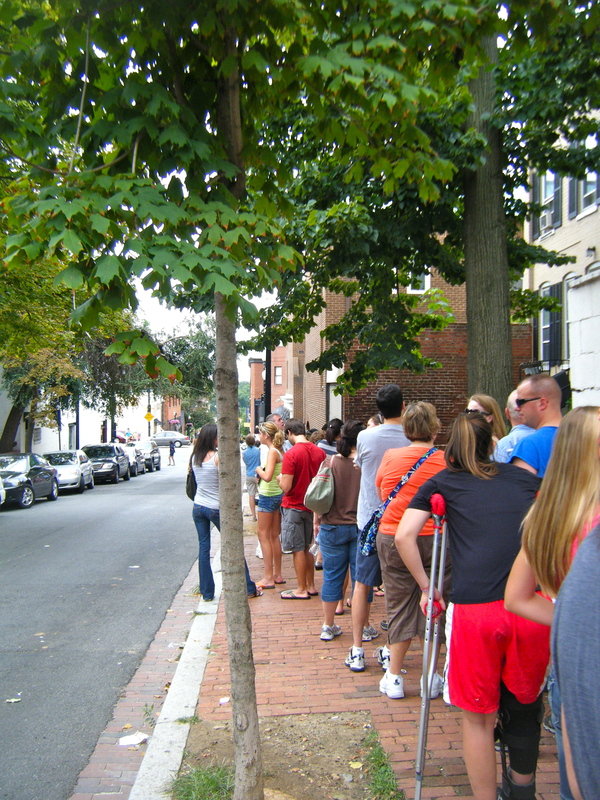 We certainly weren’t willing to doubt that wisdom, and so we dutifully got in line, which stretched down the block. We probably waited about a half hour, which is standard. Recently the bakery got its own TV show on TLC in the vein of shows like Cake Boss or Ace of Cakes. I have no familiarity with the show, but there were plenty of people seeking autographs from the bakery’s owners and various workers. We made sure to take a picture with one of the employees for posterity’s sake. 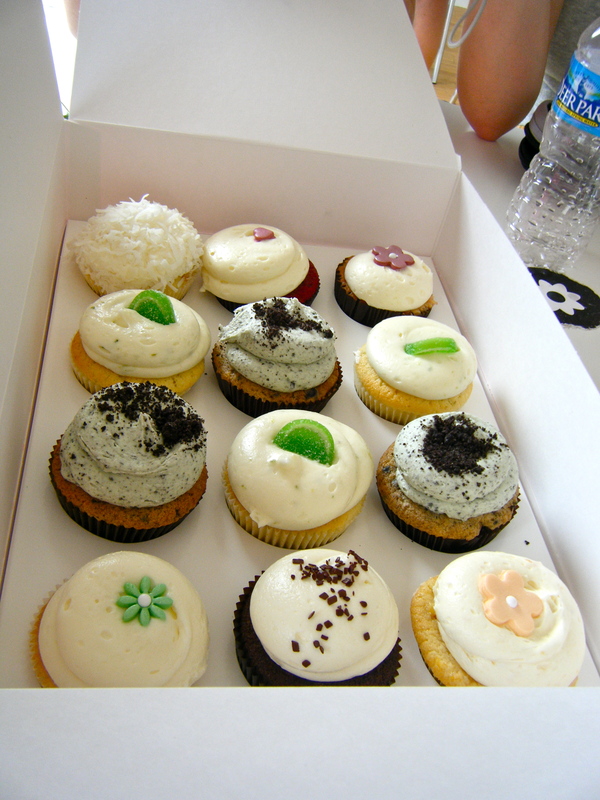 The cupcakes themselves definitely lived up to the hype. 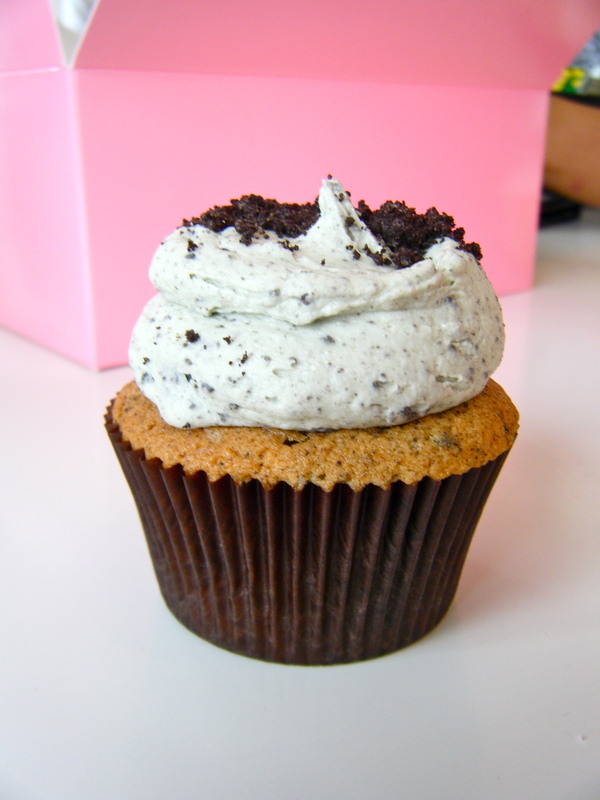 I had a Mint Cookies n’ Creme cupcake – mint Oreo icing and bits of cookie in the cake itself. It was pretty fantastic. I have a Chocolate Birthday Cupcake awaiting me later tonight, which is a more traditional chocolate cupcake with vanilla icing. Other flavors included Key Lime, Toffee Crunch, Chocolate Peanut Butter… basically, they have a ton of flavors and it’s all ridiculously delicious. Certainly if you’re not already jonesing for a cupcake it’s probably not worth waiting in line, but if you’ve got a sweet tooth and some time, you really can’t go wrong. Mint Cookies n' Creme. It took approximately five minutes two eat: four minutes of admiring its cupcakey goodness and one minute of cupcake devouring.